Director Ruben Fleischer tries to make this material thrilling and funny in that self-aware Deadpool sort of way. But the screenplay by Jeff Pinkner, Scott Rosenberg and Kelly Marcel has little that is inventive or original. The dialogue is painfully pedestrian – at one point, the local grocery store owner tells Eddie – Life hurts Eddie, it just does. Wow, that’s a revelation. The action includes a generic car chase and a climactic fight between two Symbiotes – it’s Venom, who has some principles versus Riot, a truly evil creature who wants to destroy the world. So even Symbiotes have degrees of good and evil. Who knew? On film, Venom was first seen in Spider-Man 3. This film is the first Sony production of a Marvel character. Needless to say Venom will return. I just hope round 2 has more bite. I’m going with two stars. What the screenplay lacks in character development, it makes up for in at least a couple of the action scenes which are well staged and executed, save for the anti-climax when it all converges into a massive CGI blob, quite literally. All hope isn’t lost though. 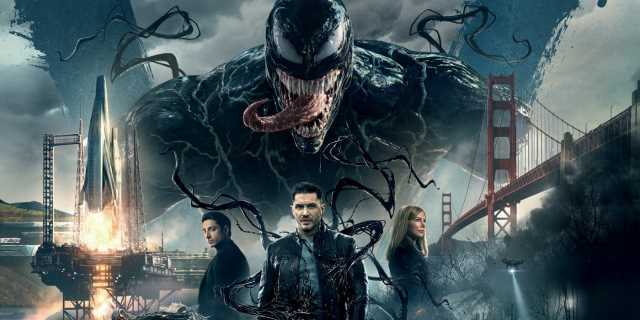 A mid-credits scene does enough to build excitement for the subsequent sequel, which hopefully will feature Venom being integrating into the Spider-verse. If nothing, Tom Hardy proves that he’s more than equipped to play the sentient symbiote, but in the hands of a more adept director implementing a tauter story. Venom” never achieves symbiosis, or anything like it. But the film’s off-kilter schizophrenia gives it a madcap appeal. While Fleischer seems to have a darker, moodier film in mind, Hardy has the good sense to steer “Venom” in a more over-the-top direction, even if the movie around him can’t catch up. But it’s something to behold. Train wrecks like these aren’t supposed to be this entertaining.